Compact, low-cost test solution for installation, maintenance, and upgrades of CWDM networks. JDSU OCC-55 is an innovative selective power meter for CWDM applications. 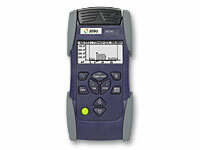 The OCC-55 is a low-cost alternative solution to optical spectrum analyzers. It scans CWDM systems and automatically records all channel key measurements including wavelength, frequency and related power level.